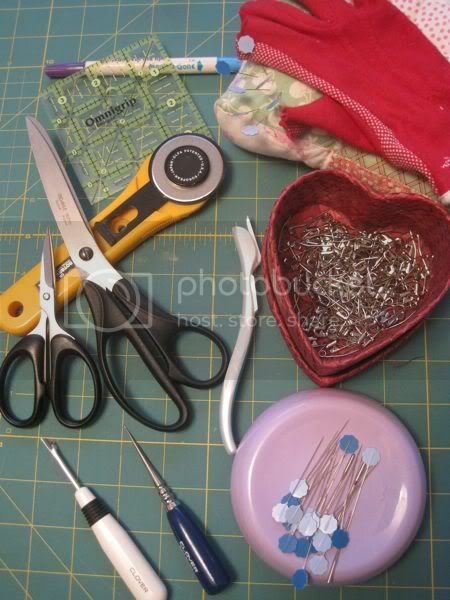 Quiddity Quilts: What are your favorite non-electric quilting tools? What are your favorite non-electric quilting tools? Clockwise from top right: Quilting gloves - excellent for guiding large pieces of fabric through the machine and or quilting. I cut the tips of the glove off the index and thumb so I can easily pick off threads without them sticking to the glove. Curved basting pins. Flat headed straight pins. Magnetic pin holder - great for when you accidentally spill pins! Pointy fabric guide - I'm pretty sure that's the technical name... don't know what they're actually called but it's a great tool for quilting curved seams. Jack the Ripper - my seam ripper. Snips and scissors and a good rotary cutter. I have several rotary cutters in different sizes and one that I keep that's just for cutting paper templates and such so I don't make the one I use for fabric dull. (I rotate the blades... when the fabric blade gets too dull it moves to the paper cutter where it works just fine for a while). Omnigrip rulers - they don't slide! And a marking pen. Most all you might recognize but one that I LOVE that's rather uncommon is the little dohicky in the center of the picture. It's a wrapping paper cutter. One Christmas when my sewing room turned into gift wrap central and everything was everywhere and it was a general disaster but I was still trying to sew... I couldn't find my snips. However the paper cutter was readily available and wouldn't you know it? It was THE BEST thing for cutting apart chained pieces. No snipping motion required at all. There's a sharp little blade under that top protective area and it's just a swiping motion that separates them... perfect for cutting thread with. It also keeps me from accidentally cutting my stitched pieces because it really won't cut fabric... so I can hurry along with no worries for those or fingers. ;-) I usually pick up a few of them right after Christmas because they're cheapest then... a buck or two. They last 6 months to a year depending on how much use they see. Do no try to buy them right before Christmas - I've seen them priced for $8 or more then! Love my rotary cutters, my magnetic pin wand, and my mechanical marking pencil with five different color leads. Also love my antique sterling silver stiletto with a art nouveau handle. The pointing thing is actually an awl - meant for poking holes. I have the same seam ripper and love it.